Chesire-based Pets At Home, the retailer of pet food, accessories and veterinary services, said on Tuesday it plans to buy back 55 vet practices from partners and close some of those businesses. 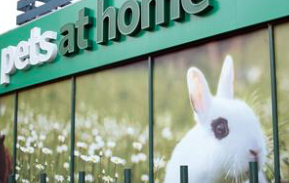 The news came as Pets At Home reported group revenue rose 6.7% to £499.3 million in the 28 weeks to October 11. Pre-tax profit slumped 80.5% to £8 million for the period after taking costs of £29 million relating to the vet practice plans. On an underlying basis and with this stripped out, half-year pre-tax profits fell 9.3% to £37.9 million. “With our JV practices, we plan to rebalance and simplify the fee structure, to allow practices to mature more swiftly and generate returns for both Pets at Home and JVPs,” said the company. “We will also offer to buy back and consolidate up to 55 practices from JVPs. “Around 25 of these will be operated as company managed practices, whilst we will consider the options for the remainder, which may result in us proposing to close them. “For all practices which we offer to buy back, JVPs will not be expected to repay outstanding borrowings to any parties and Pets at Home will settle any liabilities for third party bank loans and leases on behalf of the JVP. Pets At Home CEO Peter Pritchard said: “Reviewing our Vet Group has been a priority. “I recognise we have grown at pace and more recently, have seen the pressure that rising costs and our fees are placing on this young business. “We will need to recalibrate the business to deliver more measured growth, whilst maintaining our plan to generate significant cash profits. “We are focused on maximising our unique assets and delivering a plan for sustainable cashflow and profit growth.